Staten Island Ferry weddings - no permit needed. New York Honeymoon Apartment - plus wedding! New York's Highline Opens - Map of entrances. Improv Everywhere - Surprise Wedding Reception. Times Square & Broadway Mall for weddings? Nice magazine story - a Top of the Rock wedding! ALERT! Because Christmas Day falls on a Saturday in 2010, the City Clerk's Office is taking Christmas Eve for the Statutory Holiday Christmas Day. That means you will have to get a Christmas Marriage License by 3:45 on Dec 23 at the latest. You will not be able to get a judicial waiver on Christmas Eve either, as the Court will be closed. Plan accordingly! The TOTR will be closing at 10pm on NY Eve - so if you're planning a little quick elopement, book your officiant earlier in the day. As always, avoid sunset (big crowds)and be prepared for the touristas! Because of queries, here is a reminder. Here is the Manhattan Marriage Bureau, 141 Worth. If you applied online, or if you need an apostille, or if you want your license printed the next day, go HERE. If you want shorter lines, go to Brooklyn. You can get your license anywhere in the State of New York and be married in NYC, but the Manhattan office handles all the complicated applications and will issue the marriage licenses for international use the next morning. Go early. They also have the most staff, and if you get there early, it's pretty painless. The Museum of Modern Art, MOMA, is on W 53rd, 3 blocks from Rockefeller Center. If you're vising (or getting married) at the Top of the Rock, you can get a combined ticket for admission to MOMA for $30. The deal is HERE. 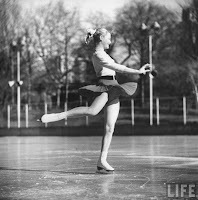 Here's a pix of Carol Heiss at Wollman rink in 1955. My friend Dixie is letting her apartment again for the Christmas Holidays (or other times, as it's available). She can provide a comfortable downtown apartment in an excellent location (with a balcony and view of the statue of liberty), AND arrange a wedding ceremony at your location of choice, or in the apartment itself. I've stayed there - great views at night! Drop me a line at info@weddingsofnewyork.com and I'll pass on the contact information if you wish more information. Wedding Granny Eileen sends this email from the Staten Island Ferry crew: "We do not provide permits to get married on The Staten Island Ferry, however, people are allowed to get married, if they bring their own officiant & if they can board the vessel and perform the ceremony within the 25 min trip, without being disruptive and obey any directives from the crew". Of course you still have to SIGN THE LICENSE ON LAND. ArtsyNewYork. This is a very quick Blogette on free museums and lectures and concerts and artsy touristy stuff to do in New York City. I wrote it for a friend of my daughter's who is visiting NYC. It's quick, it's incomplete, and I'll try to make it better. But enjoy! Yes, we do them - in fact, just as we were the first do to a HighLine wedding, evidently we performed the first Gondola wedding. Our senior wedding granny, Beth, performed a lovely wedding (with children!) in the Central Park Gondola at 9am last Saturday, getting a nice early start before the tourists. Just a heads-up for Phase 2. See the Washington Square Park Blog for details. Note: the arch is restored and open. Election day AND Veterans Day AND Thanksgiving. Plan accordingly! We have done several nice weddings, from 30-100 people, in party rooms at condos. We had a particularly nice event on Roosevelt Island on the top floor of a building which is primarily Columbia Student housing - a great view. Catering by - Fresh Direct, supplemented with pot luck and a home-made wedding cake. Simple and fun. Start asking your friends for party room privileges at their apartment buildings. On the 14th Floor. It can be yours for a private wedding - with a little negotiation with the concierge, of course. Here's a lovely (astonishingly tall) couple, with a great view of the harbor. Photos by Kim Coccagnia. "I think the menu pretty much speaks for itself... it was simply magnificent! They also gave us each a free glass on champagne and all of the deserts beautifully presented with congratulations free of charge!" Here's Eileen, one of the "wedding grannies" with a lovely couple at the Top of the Rock. They're outside behind the safety glass. If it's windy or damp, you can stay inside in the covered observation room and run out for pictures afterwards. 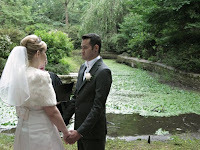 PLEASE NOTE: TOTR is best for SMALL weddings and elopements - not large groups. It's often crowded, and everyone has to pay the admission fee ($20 - discount coupons on the plaza outside). We have had a few requests for accommodating elderly or disabled guests in the Park. If you pick your spot where it is accessible to a paved access road/path, you can transport your guests via Pedicab (they can go places the horse carriages cannot, obviously). Make sure to work out a pickup time after the ceremony. Cop Cot is close to the street, but up a giant hill - hard to walk, and too high to ride up. Choose a fairly level place, close to one of the park roads and paved access paths. Cherry Hill is a good example, from which you can walk to Bow Bridge or Wagner Cove or of course Bethesda. The rustic shelter in the Dene is walkable from 5th, The Mall is good, lots of nice statues and planters. Bring along a lawn chair if there are no benches nearby. Here's a picture I took from Wagner Park, at the foot of Manhattan, to the West of Battery Park, looking out to the Statue of Liberty. It's a great spot for weddings, and often overlooked. Relatively quiet during the week, great restaurant under the bridge for celebrating (Giginos) and a bit of shelter in case of a sprinkle under the walkway. I got an email back from the British Embassy regarding UK residents and US marriage licenses. It confirms my understanding that UK residents do NOT need an apostille stamp. They ask UK residents to "Please visit the official web site of UK DirectGov at "Registering Life Events". See: Registering an Oversea Marriage. Note, you can also send your original NY license (once you get it in the mail from the NY City Clerk) to the GRO (General Registry Office) and they will register your marriage in perpetuity in the UK. You must apply for a marriage license IN THE STATE IN WHICH YOU ARE BEING MARRIED. You cannot bring a Texas or New Jersey license to New York. In other words, if you get married in Barbados, you apply for a Barbados license, and get married by a Barbados officiant. If you're being married in NYC, you can apply for a marriage license ANYWHERE IN THE STATE OF NEW YORK, but you must be married by an officiant who is certified by the CITY OF NEW YORK (the 5 boroughs). Waiting period: The waiting period for a marriage in New York City is 24 hours. That means if you get through the line and get your license stamped at 2:13pm, you can be married after 2:13pm the next day. Of course City Hall is CLOSED on the weekends, so if you apply on Fridays, you'll have to come back on MONDAY to be married at City Hall, or find a certified officiant to marry you on the weekends. After the wedding, if you need your official marriage license right away (instead of waiting for it come in the mail), you must go BACK to the Manhattan City Hall the next weekday morning with the license, properly signed by yourself, the witnesses and the officiant, and you can get the official certificate for a small fee. This is only possible if you applied for your license at the MANHATTAN office at 141 Worth Street. 100s of trees toppled NY Times. “It seems like Central Park was essentially the ground zero,” said David Wally, a meteorologist at the National Weather Service’s office in Upton, N.Y., on Long Island. 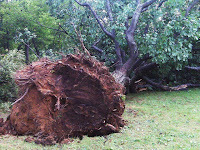 “Manhattan, the Bronx and the northern part of Queens were the primary recipients of the severe weather.” At the height of the storm, shortly after 10 p.m., the city’s Office of Emergency Management reported that more than 100 trees had been felled, with the damage concentrated on the west side of the park near streets in the 90s. I think it's mostly elms on the Great Hill -- sigh. We're having a nice surprise party wedding next week. The couple have asked their friends and family to dinner to celebrate their engagement, and then I'm going to make an appearance after the cocktails, and ask the couple to come forward -- and we'll have a wedding, instead of just a party. Only two people are in on the plan, and it should be a wonderful family event. The ceremony will be simple, they have bought a simple pair of rings, and we'll be sure to have a camera ready. We've done this before, and it's always wonderful. Get your license a few days ahead, have a plan for pictures, a special dessert, glasses for toasting, and lots of hugs. They are going to ask their mothers to hold their rings, after they announce the plan, and their sibling/dad will sign the license. I think it will be memorable. When you're filling out the Parks permit, the NAME of the park on the pier in Red Hook is: Valentino Pier, named in honor of firefighter and Parks lifeguard Louis J. Valentino, Jr. (1958 – 1996). Valentino lost his life while searching for wounded firefighters in a three-alarm blaze in an illegal Flatlands garage. (apartment now occupied - sorry! )Want to avoid hotels? My friend Dixie now has an apartment available for honeymoons - and she'll throw in a wedding & marriage officiant. Here's her suggestion: Obtain Marriage License on Friday; Wedding Ceremony on Saturday or Sunday; enjoy your New York stay in a beautiful balcony apartment overlooking the Statue of Liberty! She's got lots of lovely parks close by with great views for a wedding. If you want to know more, drop me an email at info@weddingsofnewyork.com and I'll pass it on to her. Our friend KC also has a photography package to offer and a limo and hair and makeup available. After a week of fun Hipster weddings in Williamsburg, I noticed today that Brooklyn's East River State Park, which we had just adopted as a 'post-industrial urban setting with grass and City Views', has now become the new concert venue for the displaced McCarren Pool concerts. This article from the NYTimes lists the OTHER concert venues this summer, including Governor's Island, the South Street Seaport, Central Park, etc. So if you're planning a quiet wedding - check the concert schedules first! "With its twenty-foot ceilings, spiral staircases, mahogany balconies, and rows upon rows of books, this downtown bookshop resembles an Ivy League library. It can hold up to 120 guests for a sit-down dinner, with in-house catering available but not mandatory. Hourly rental rates start at $500, and every cent goes to benefit the homeless living with AIDS". We're marrying 5 couples at the Martha Stewart PopUP Wedding Chapel in Williamsburg, Brooklyn in June. Here are some pix from the photoshoot for the first wedding. And here's the little ABC News clip. Best wishes to all the lovely couples - a pink time was had by all. pix by Jason Kuffer. Yes, you can get married at the Highline. But for now, why not just enjoy a quiet walk? It's not very big (only the southern end is open), and a brief small wedding of 5 people might be nice - but there are so many BIGGER parks to choose, of course. We'd hate to see this oasis of calm get swamped with events (though we have already seen wedding photographers clump up the stairs with high-heeled bridies). Here's a MAP of where you can enter. UPDATE: OK, we DID marry a nice couple on a Monday Morning - very quick, 20 people, we had to run from the rain, but it was fun. But it's generally impossible later in the day or on the weekend - the guards will tell you stories about the crowding and the lines and the hissy fits over the lounge chairs, etc. Improv Everywhere decided to choose a random couple emerging from a City Hall wedding and give them a free 'wedding reception' across the street in City Hall plaza - complete with a marquee, music, a cake, presents, bridesmaids, toasts and the macarena! Here they are, right downtown under the tent, tasting their Wedding Cake! Note the bride saying (at the end of video) "Everything happened so fast in there, we wanted something more - and then we got it! I didn't know New Yorkers could be so nice". Then they take off (in the rain) in a pedicab with 'Just Married' on the back. This pix by "'Agent' Sokoler also see pix by Agent Slocum" ENJOY!!! -- as in sunburned. Here is a pix from Streetblog on the new car-less pedestrian MALL. We were there today - wall-to-wall tourists guarding the free folding chairs with their lives. Fun, if you want to be on a zillion home videos. UPDATE June 11: And of course, it's STILL a rainy summer - Via Gawker, here are some Military Brides getting married in Times Square (and avoiding the garbage). July 4 will be an interesting weekend. (Write us at info@weddingsofnewyork.com if you're considering a wedding this week and we'll give you personal advice). The fireworks are moving to the Hudson, so the East River and South Street Seaport which has a great view of the Brooklyn Bridge, might even have standing space. If you want another memorable background, try Wagner Park, with a great view of the Statue of Liberty. Or of course Brooklyn Bridge itself, or the Brooklyn Promenade (right) or the Fulton Ferry Landing for best views of Manhattan. As everyone heads to the Hudson river after supper to see fireworks, consider a 6pm wedding in less crowded parts of Central Park. 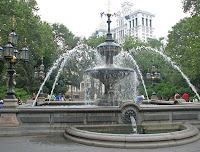 Or perhaps the gaslights and fountains of City Hall Park - (right) a little more shade than Times Square, and just as historic. Happy Holiday! Curbed has pix. As iconic as Tompkins Square, but temporarily cleaner. We've had a couple of requests to marry couples under the arch. Fishbowl, but fun wedding location. Here is a stunning picture from last week of a couple standing in the balcony of the Belvedere Castle (nature center) in Central Park. NO YOU CANNOT BE MARRIED IN THE CASTLE OR ON THE BALCONY. The couple were married by the lake, and then went to the Shakespeare garden and the castle for (wonderful) pictures by Kim. There is a sign in the castle which says: "Welcome - no weddings (proposals only!)". Please don't try to convince them, just enjoy the spot and the pictures. Yes, it's been a rainy spring. We've moved a couple of weddings inside - but it's still a beautiful location, if misty and drippy. The good news - less tourists! But be prepared for soggy grass, soppy riverbanks - and very few places for shelter. In a pinch (Ladies Pavilion probably occupied) try under the Minton Terrace at the Bethesda, Dene and Cop Cot shelters, with umbrellas, the Pavilion at the Bethesda (may be occupied), or one of the stone bridges with a nice view to the other end. We had two small weddings under the Dairy canopy, lovely and dry. Or have a brief ceremony in your hotel room, get a nice Chinese paper umbrella and take a romantic carriage ride through a misty park. It's inevitable: unless you book a very private room somewhere, the sounds of the city will intrude somewhat on your wedding ("the rumble of the subway train, the rattle of the taxis" - the lullabies of broadway, of course). If you enjoy the ambient noise of the city, it's just part of effect. But just remember that you are outside in a city of millions of people - not sealed away in a chapel or hotel room. Central Park on a Saturday evening is usually LOUD. Concerts, impromptu musicians, amplified music at Wollman Rink, inline skaters with boom boxes by the Mall, the guy who busks by the Ladies Pavilion with the endless John Denver songs, the Tango dancers, SummerStage, and last night, a really loud concert in the Bandshell, which could be heard all the way to Strawberry Fields (where there was the usual Saturday evening jam). And I was at a wedding at the Boathouse with a 12 piece band that rocked the lake. So if you want a quiet wedding in the park, go north, go waaay east, or don't get married Saturday night in the summer in the usual places unless you're prepared for the city at play soundscape. Though, of course, you can find nice quiet spots at any time -- just be prepared to walk a bit further away..
Grand Central is noisy. Battery Park is noisy. Water taxis disturb weddings at the Brooklyn bridge parks and at Fulton landing, and Red Hook. The subways crossing over in DUMBO (DOWN UNDER MANHATTAN BRIDGE OVERPASS)are going to interrupt your wedding every 6 minutes. Remember that planes change their flight plans at dusk - and often fly over the lake and ponds. We had a wedding on Gapstow Bridge interrupted by a big gas lawnmower on Saturday. School and tour groups suddenly appear anywhere - squealing loudly - at Strawberry Fields, the Top of the Rock (we married a couple there on Wed. and had to wait till 120 kids decided to go to another level), and of course Times Square is what it is -- at least they aren't yelling outside the MTV window these days. Always check park events - even Fort Tryon Park gets festivals and events. But it might be fun to get married during the Renaissance Festival! They've boxed the trees and are repairing fences to the South, and will move around over to Cherry Hill and work on the shoreline. The small rustic pavilion is inaccessible, but the LP is still open. UPDATE: The fence is up to the LP, and they've closed off the bridge and walkway by the Ramble, too. In talking to the work crews, they indicate that the work is on the southern shoreline first. But the permit office is still indicating that work will actually be done around the pavilion, so they have stopped issuing permits. We're going ahead with our booked weddings, but have alternative plans just in case. If you have a permit for a wedding already, and your group is smallish, all may be well, or you may wish to call the permit office and try to rebook. We don't know how long this will last, so I'm not sure about Fall. Consider some of the other little rustic shelters around the lake for small weddings, or of course Cop Cot, the Belvedere (castle) terrace with the gazebos - here's a picture looking up from the Shakespeare garden, or even the Dene, on the East Side. Be creative - go NORTH to the lovely spots around the Mere and the pool - or try to book the terrace in front of King Jagiello which looks at the castle and the turtle pond. Explore the park! You can sign up for a weekly or monthly newsletter on the Central Park website, and be aware of any special events in the parks. Be especially aware of concerts and races - which can impede access to popular wedding locations. Here's a fun picture of multiple brides on Fulton Ferry Landing, below Brooklyn Bridge. I shot it from the bridge, while waiting for a bride. It's WEDDING SEASON! There was ONE wedding happening on the bridge (to the back, where you can't see it), and the other 5 brides are having photo sessions. There was also a wedding on the terrace at the River Cafe, which is on the other side. It's pretty obvious: if YOU can think of a romantic spot with a good view, so can everyone else! So be prepared for other weddings and wedding photo sessions in your vicinity. One solution is to have your actual wedding in a more secluded spot, and then go to the touristy areas for the photo ops. And, of course, try to reserve your spots in the City Parks, even if you have less than 20 people. It gives you right of place - which you should exercise diplomatically. Everyone is always quite friendly and if your chosen location is full, you can always find another nice spot - New York is a big place. But write to us if you want our advice about your location choice in "high season". Cheers! It's DEAN POLL, who runs the Boathouse. In other news: Cafe des artistes is closing, too. You may have been following the bidding war for the new lease for TOTHG - but here is a NYTimes tour of the potential bidders - End result. It will still BE here after Dec 31- but not necessarily under the same name or owners. Book carefully. Veteran actor Robert De Niro has now set his sights on one of New York's most famous restaurants - Central Park's Tavern on the Green. He already owns more than 20 restaurants around the world The Oscar winner is a regular diner at the Tavern, which has appeared in movies such as ‘Wall Street', ‘The Out-of-Towners' and ‘Ghostbusters' and is currently the second highest grossing restaurant in the U.S.
Gothamist: "Sure, proposing on the bustling pedestrian walkway of the Brooklyn Bridge seems picturesque, but perhaps being up there holding on to a tiny ring with your nervous, sweaty, about-to-propose hands isn't actually the best idea. One would-be-groom has learned that the hard way, and he showed up on the Today show earlier to tell his harrowing tale. Don Walling got down on one knee in front of his fiancee-to-be, Gina Pellicani, but "then the ring flew out of the box and fell to the roadway below." Whoops-a-daisy! Acting fast (and not so sensibly) he climbed down the bridge to get to the roadway, triggering a suicide jumper alert! Once he convinced the NYPD he wasn't looking to take the big dive, they helped stop traffic and he was actually able to retrieve the ring as his would-be-fiance and her family were watching (and filming) all along through the giant gaps in the walkway planks"
Normally we post all the organic/ ecological wedding tips on our sister blog, agreenbride.com . But I couldn't resist this: Sam the jeweller has a studio RIGHT DOWNTOWN on Maiden Lane, where you can make your own wedding rings: "Spend a day in our fine jewelry studio learning to make your own wedding rings. Our professional jewelry workshops allow you to make meaningful custom wedding rings with your own hands while you enjoy the fun experience of being a goldsmith for a day. Create your own wedding rings with 100% recycled: gold, platinum, palladium, or mokume gane". You work directly with a goldsmith, and he says you'll have your rings in 1-2 days. There seems to be another studio setting up San Francisco. Explore! May is turning out to be a very popular month for weddings this year. Even if your wedding or elopement is SMALL, (under 20 people) consider booking a spot in the park with a $25 permit from the Parks Department (see the link at the top of the page, and the article here). If you don't live in the US, you can ask your officiant to apply for the permit, as they need a zip code to mail the paper copy. Write us with questions, we'll be happy to share our hints on park weddings. Here are more pix of Central Park in the Spring. Here's a nice article about eloping in NY in the NY Daily News. 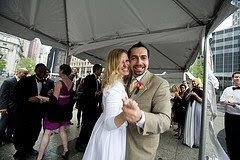 It was fun to talk to the reporter, Gina Salamone, about why people decide to elope, and offer some hints on arranging a romantic and inexpensive wedding in NY. (You'll have to read the article to see what I suggested :-) And isn't this a super picture by Ryan Brenizer, who shot C & G's wedding this October in Central Park? That's them in the tiny pix at the top of the page, by Lake (with the San Remo in the background). Fall weddings can be wonderful! Map HERE, fantasy drawings HERE.I'm guessing the main goal is to have more eyes and ears on the Minton restoration, which got graffiti'd in February. Update: They're digging the paving blocks and re-arranging the fences - so it's a go. Maybe by Memorial Day? Mayor Bloomberg has announced Times Square will become a pedestrian mall for 5 blocks in May, as the city tries to ease traffic congestion in the theater district... Cars will be banned on Broadway from 47th to 42nd streets and the avenue given over to chairs, benches and café tables with umbrellas. So yes, if you REALLY WANT it, we will consider marrying you in Times Square - but it's going to be berryberry crowded, capisce? Better for pix, not the ceremony itself..
We have met many wonderful photographers in NY. You can find a list of some we have worked with HERE. We particularly enjoy working with Beowulf Shaheen and Kim Coccagnia and Ryan Brenizer. I'll start a list of photographers at the side when I get a moment. I usually ask eloping couples what ELSE they are doing in NY (besides getting married). Here is an easy way to get broadway tickets. Go to BroadwayBox.com. You do not need to register online (Like TheatreMania.com), and you can find coupons contributed by other users. There's Broadway, Off-Broadway, sports events, music, and other treats. WATCH EXPIRY DATES. Print the coupon or just call the box office with the discount code. You will get better seats by going to the Box Office with the coupon than standing in line at TKTS, and it's usually the same discount. Tourist discounts: Hit the Tourist Office at Times Square, and pick up little wallet cards for $5 off Circle line tours, $2 off Top of the Rock, even a free cup of coffee at the Met museum. These make great favors for your out of town guests as well. Here's a useful link to calculate sunset time in New York on your wedding date. And I've added some webcams in the links at the right so you can check weather and traffic - and see what people are wearing today. And here is a currency exchange, for quick calculations about funds. Here's a fab couple from the UK again, with shots from their super photographer, Steve Gerrard. 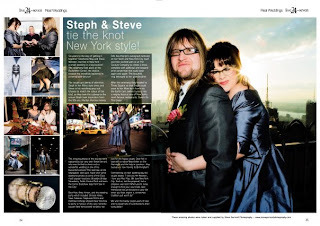 Their "New York Wedding Story" has made it into the February issue of Live 24/7 Magazine (only available in the UK, sorry! )Congrats to all! Planning an elopement or private wedding is pretty simple - but just like a big wedding, you can eliminate some headaches by thinking ahead. 2. Go to City Hall EARLY and get your license before the lines get long. They close at 3:45 sharp. Don't forget to bring your license the day of the wedding. Make sure you have witnesses for the ceremony, or ask your photographer to be a witness (or the hotel concierge, or of course a friend or family member over age 18). 2. Make 'bad weather' plans. Always have a backup plan for an outdoor ceremony (even if it is your umbrella). You can always have a ceremony in your hotel room, and then go out on the town to visit famous landmarks or even take that romantic carriage ride in the mist or snow. 4. Charge your camera batteries. 5. Take along some cash if you want to ask a park musician to play for you, or to tip the concierge for letting you use an empty penthouse suite. 6. Plan your post-wedding drinks, so you know where you'll go to rest your feet before dinner. This is the time to enjoy famous watering holes (The Algonquin, the Plaza, The Boat House, Cafe Des Artistes - or the magnificent views at Beekman Towers) - then go somewhere else fun for dinner, after all, you're all dressed up! 7. Check sunset times to make sure you leave enough time for post-wedding pictures. Here's a couple cutting sunset a BIT too close! 8. Enjoy yourself! You picked a romantic elopement and a big city experience. Have fun amid the traffic, the tourists, the taxis and the trees. Go with the flow and roll with the funny stuff. Buy your flowers from a local florist or street deli. Go down to Times Square and wave at the folks back home on the Web Cam. Take the ferry, or a horse ride, or just walk through the park arm in arm. Congratulations! Feb 2, Groundhog Day or Candlemas, is the Feast of St. Brigid (Secondary Patron of Ireland) and Lá Feabhra - the first day of Spring. Brigit, seen here as a female smith, is called Bride in Scotland. 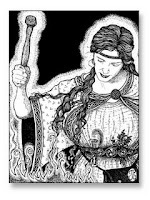 Brigid aids any woman about to be married, and the woman is called “bride” in her honor. See more here. We mentioned that the famous Rainbow Room may (or may not) be closing, due to back rent. "Restaurant Week has now been officially extended into next month. Over 150 participating restaurants will continue offering three course prix-fixe lunches for $24.07 and three-course prix-fixe dinners for $35.00 (excluding beverage, tax and gratuity) through February 27th. Wined and Dined has an abbreviated roundup of some of the participating restaurants and their individual quirks... Peruse the entire roll call of participants at NYC Go." We've started a list of "restaurants and venues with views", at the left. These are generally locations we like, where we've conducted weddings. And our "wish list"? Try Dizzys Jazz Club right on Central Park at Lincoln Center. Available for daytime rental. Or RISE at the Ritz on Battery Park (also afternoons). Lots of other fancy places, like Asiate, but there are smaller, quirky places with views as well. Like Pete's, the famous pizza place by the Brooklyn Bridge with the great view. They have a private room and cheap catering menus. Go hunting! Biggest Day of the Year. Weddings, Proposals AND wedding photographers all over the place. Fri. Feb 13 will be CRAZY at City Hall. Consider scheduling your wedding for earlier or later in the week - flowers and champagne will be a silly price on V Day, and restaurants will be trying to think of some way to turn tables when couples want to sit and hold hands... it's New York, after all. Advice: Avoid the Empire State Building, Top of the Rock (lines will be TERRIBLE), and popular parts of the park (Strawberry Fields, Ladies Pavilion, Bow Bridge). Look up "Romantic Restaurants" on menupages - then don't go there. Or best of all - have your last 'single person' date on VDay, and get married February 15. You can repeat that 'last date' every year on Feb. 14! As some of you are planning spring weddings, I'm going to start a list of gardens: community gardens, botanical gardens - and restaurant gardens. I've added a list of restaurant gardens at the side, and put the other gardens under Non-Profit spaces. If you want to walk to Central Park from your hotel, there are a few options. Most people pick a location on the West side of the park for their weddings - though the East is just as nice. Here are some westside hotels which couples have chosen as they can be used for ceremonies in bad weather, but are walkable to mid-park if it is fair. NYC Hudson W 58th. Trendy. Lucerne Amsterdam & 79. Old Fashioned. You can find others on any search engine, by using "Upper West Side". There are a lot of boutique hotels - just be sure the rooms are big enough to hold a wet weather ceremony, unless the hotel can offer you another room for an hour.